Want to be in one of the most beautiful parks in the world? If on vacation to England, just come to Hampshire, where you will find Exbury Garden. 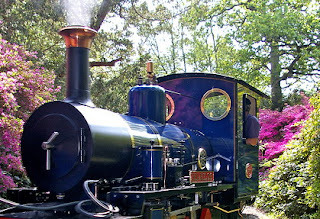 Exbury gardens with its steam railway is considered as a magical place that will attract your attention for a while. The park is also located in the New Forest National Park has a total of approximately 200 hectares. You can get there from London Waterloo station on the way for 2 hours. After arriving at the park, you will just feel like being in heaven that filled with various colors of flowers, shrubs, and plants. Regardless of your age, when love the beauty, you will definitely enjoy every corner of this park. During their stay in the park, you can also enjoy a steam train that was one of the popular attractions. For 20 minutes, you will be brought to the corners of the gardens, looking at various animals such as squirrels, deer, or rabbits. Exbury gardens are also home to several rare plants such as Tupelo and Oxydendrum. While some collections of flowers that you can see the Rhododendron, Azalea and Kamelia. There is also the neoclassical style Rothschild houses open to the public. When the family decided to come together, then summer is the best. This is the right season for a picnic where two regions has been prepared for that purpose. Exbury gardens seems absolutely perfect place for relaxation and tranquility. You'll also be amazed when hearing this park has a collection of more than ten thousand varieties of flowering plants that will be lively at flowering season around May to June. No matter what time of year when the chance comes to Exbury Garden, you can enjoy its beauty on any day starting at 10:00 to 17:00 local time. The entry fee for adults around 8.5 euros, children 3-15 years of age about 1.5 euro.